I have never heard an Arab woman call her sweetheart the Arabic word for honey—or vice versus–even though Arabic is a language with scores of other terms of endearment. I have never read any Arabic children’s stories about goofy bears getting stuck in honey pots, and I’ve never seen honey come in cutely shaped squeezable bottles at the souq. And yet honey is the queen bee of foods in the Arabian Peninsula, specifically in south Saudi Arabia, a region that is on a perennial honeymoon with honey. The word honeymoon does in fact exist in Arabic, and women in Arabia prepare for it meticulously, including buying the skimpiest silkies at enough lingerie shops to make Victoria’s Secret wonder who really knows the secret. But the honeymoon is a relatively modern practice and a literal translation based on, depending who your source is, a 16th century British cynic’s observation that marriage is really only joyful for its first moon cycle, an ancient custom of newly married couples imbibing aphrodisiac honey wine (mead), or a Babylonian practice of a groom giving his bride’s father all the mead he can drink during the first month of marriage. This Babylonian story is closest to home geographically, but under Saudi laws, no one today is making honey wine, at least not legally. Not that honey is without its legal loopholes: Undocumented Yemeni workers have been caught peddling honey from their homeland—legend or desert myth has it that honey smugglers transport coveted Yemeni honey across the border either as is or with other goodies, from weapons to drugs, nestled in its highly prized gooeyness. 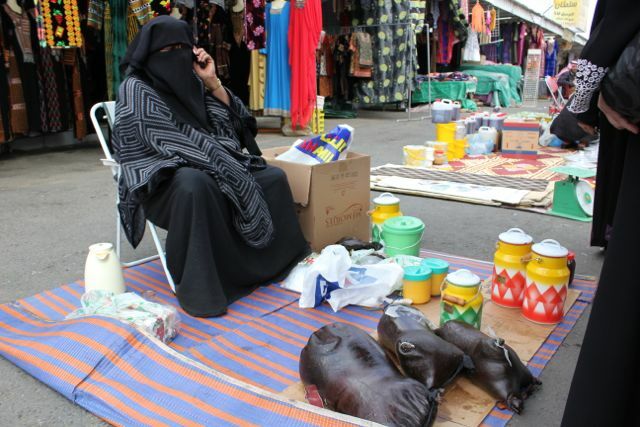 In the souq in the southern Saudi city of Abha, honey is the most competitive product being hocked, with vendors calling out the virtues of the local honey—color, thickness, taste—to veiled women who discreetly lift up their niqabs to take a tasting from the plastic spoon offered to them. Not even dates (as in the food) can compete for attention. People will go by chickens being de-feathered and piles of greens, but just like the flies, they can’t ignore the honeycombs on the sidewalk. I read somewhere once that along with the Germans, the Saudis are the world’s biggest consumers of honey. 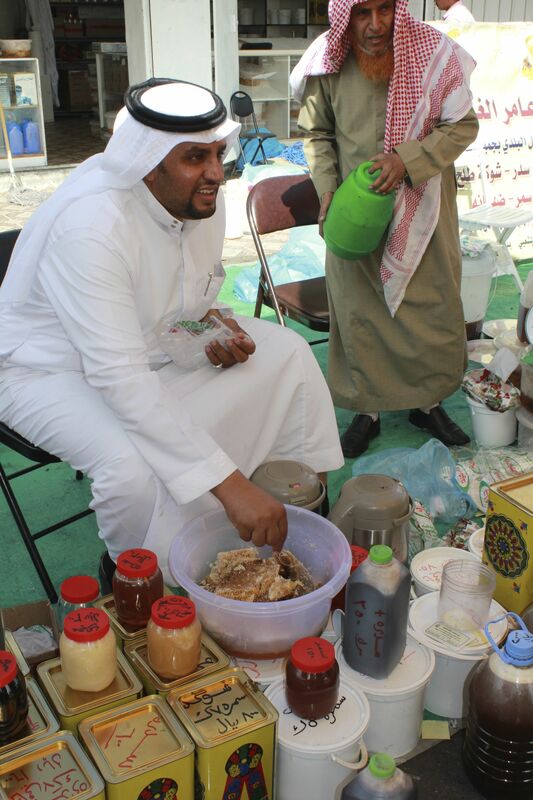 But I never thought of honey as an art form until I got to the Abha souq. After sampling a few, we discovered that every beekeepers honey has its own color, texture, and nuanced sweetness—and sometimes even its own bite and acquired taste. Samar honey, which comes in various shades of gold, is sweet and light, stuff you can easily understand Winnie-the-Pooh trying to score. But with the red-toned sidr honey, my first spoonful was like medicine, a layered pungency with an overpowering smell that made me say “yuck” out loud. The local version of butter is indeed honey’s sweetheart here. “Every morning we eat honey with samna,” a Saudi painter with a studio in Abha told me. Samna is clarified butter or ghee from sheep’s milk. It is definitely an acquired taste I didn’t wish to acquire beyond the first try. At the souq, the samna is sold in mosaic-patterned containers or in skin sacks the size of small lambs. 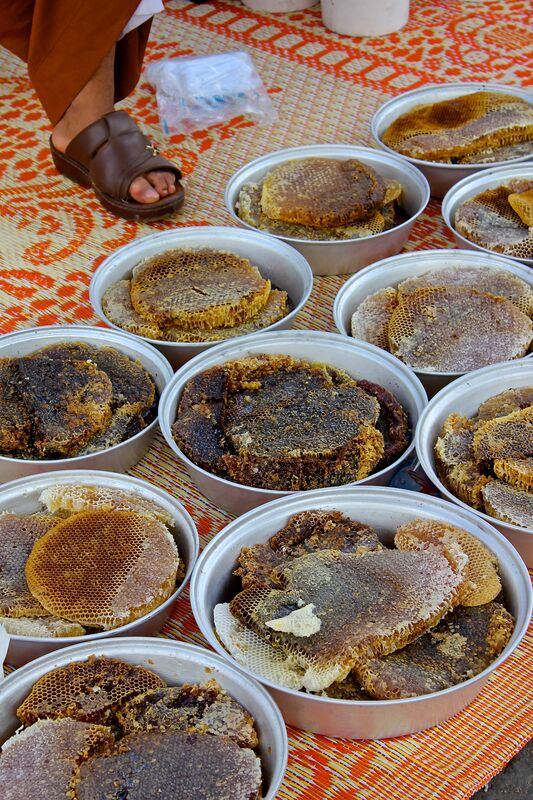 For all the honey of Arabia, there is little creativity in its culinary use in Abha: It is simply the kick to various forms of bread and porridge, which are topped with honey –and often samna. The breads and porridges are not sold at the souq, but many originate from the valley’s rich wheat fields. When I brought home the Abha honey and put it up against the other honeys in the kitchen, it was, as the vendor I finally settled on promised, so much richer than the others, not in color or thickness but in the purity—not sugary, not waxy, just a sweet flowery, lively smooth spoonful that takes one to a green field somewhere, full of sophisticated gradations of flavor and life.